Take the original image and compress it to WebP and JPEG using all possible quality levels. In both cases, the compression program accepts values between 1 and 100, so you get 200 compressed images. 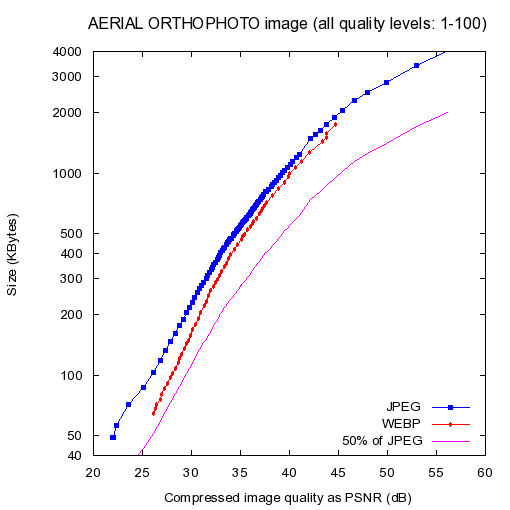 Find out the PSNR value (lossiness) for each compressed image. 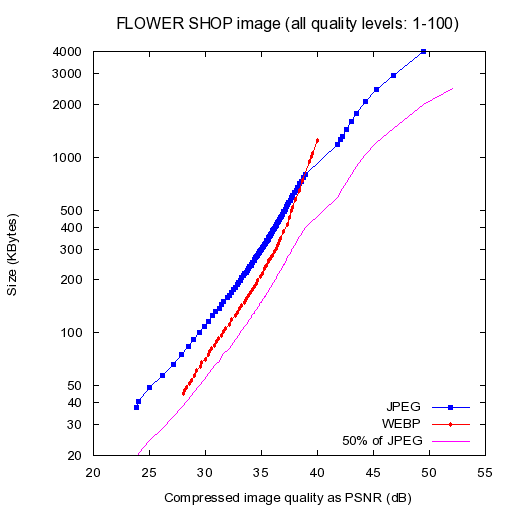 We can see that the WebP format is able to improve JPEG’s performance by about 40% in certain cases. Apparently they have targeted PSNR values in the range [25-30]. 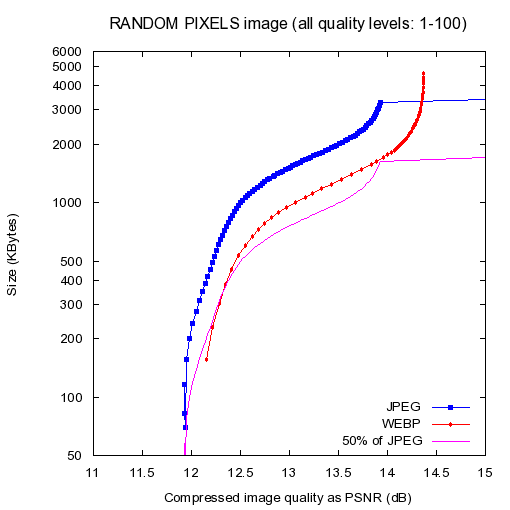 If you need a very low level of lossiness (PSNR above 35, for example) you may find that WebP is not better, or even is unable to provide such images. It will be interesting to see if Google adopts (or at least supports) this format in their web browsers, mapping apps, etc. Even if we assume that WebP is, let’s say, 30% better than JPEG globally, will it pay off in a context where capabilities, requirements, volumes etc. often evolve with a geometrical or exponential rather than linear pattern? I tested it WebP myself, visually. I used a PNG image and created a JPG image with 10% quality, and a WebP image with 10% quality. I soon noticed that the JPG image looked much better! 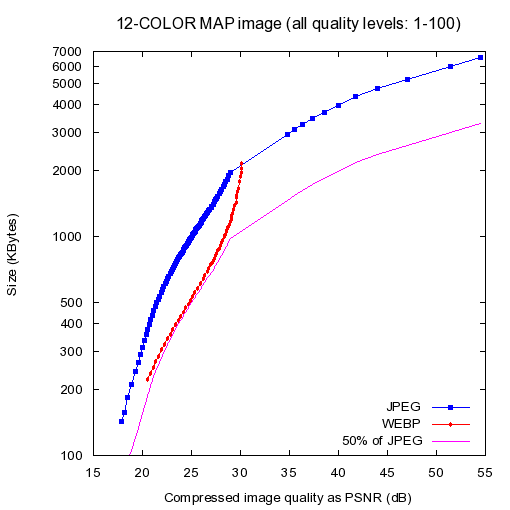 I concluded that WebP needs its quality set to 70% in order to match (not even beat) the JPG image regarding visual quality. The PNG image is 2,141KB, the JPG image 78KB and the WebP 65KB. The WebP file is around 20% smaller than the JPG. I saw some comparisons by Google, and I noticed that the JPGs they used for comparison were set to a much higher quality (i.e. they take up more space) for generating unfair results. Be wary, don’t believe everything. It sounded too good to be true so I tested it and I got different results. I have not tested the transparency or its lossless capabilities. A 20% smaller image is indeed impressive, but don’t believe all the tests out there, do a test yourself! Hello, Roland. Thanks for your message. I have not done any tests after this post. In my opinion, WebP is only a bit better than JPG, and in any case, the improvement you get is probably not enough to start an expensive campaign to replace JPG, especially in a world where band width is constantly improving.